I mentioned I was doing a small Aestlight shawl with some 5 ply of unknown length. I am quite unsure just how far the yarn will go, so have decided to turn it into a neckerchief, for want of a better term Definitely not a shawlette. Eeeuw! Not a pleasant word to write, look at or say. So I wanted something fairly mindless but still attractive for which I knew I would have enough yarn. I poked around on Ravelry and found I had already stored the Striped Study shawl in my library. 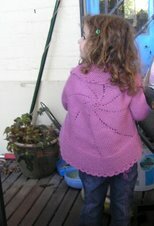 It's originally done in 4 ply on 4 mm needles but I had plenty of two colours of Bendigo Melody which is an 8 ply. 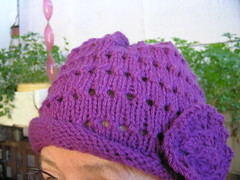 I'm using 5 mm needles but have much more wool that that specified in the pattern for the thinner yarn. There should be enough. I have black and a lovely deep forest green and am happy with the combination. 12 repeats of the contrast stripe are called for. I'll see how big the shawl is after ten repeats of the thicker yarn. I've done seven contrast stripes. Look! Patterns on the Kindle. This makes it very easy to carry around and it's clear. I can mark and make annotations if needed too. I think clicking on picture should enlarge image. I've downloaded a copy of Nikon D3100 for Dummies and am making progress through it. It's much more clearly written than the manual which came with the camera. I'm gradually getting what I need here. I think the only major purchase left will be bookshelves for the spare room. I've priced some which are sturdy and reasonable to look at but need to arrange for not only delivery but someone here to help with the delivery. Oh, I also need a sofa bed which looks fine, is comfortable, well made, and easy to use. I haven't yet looked for one at all. My son scored a new TV for me on ebay and I hope the delivery is today. I've been tracking it and it should be. He paid $243 for something which is over $400 retail and it costs another $39 to come from Melbourne. All bells and whistles on it, live pause or whatever it's called, flat screen, lots of other letters too denoting what he says are good features. 32" which is fine for the size of the room and for me too. I don't like the room to look dominated by the screen and I don't watch it for hours on end. I haven't watched TV for 17 months now so am right out of the habit. However, I think that with winter rapidly approaching it will be pleasant to be cosy knitting and watching. Particularly as I'll be by myself most of the time. Lots of visitors on Mother's Day and dinner the night before too. Two sons and their families. A simple, easy lunch of homemade chevapi, BBQ chicken, salad, sausages etc. Most of the grandchildren hadn't been here so were glad to see my new place. It was all very relaxed.The picture is Master 5 with a crewcut from his hairdresser mother. He took blunt children's scissors to his hair and ended up with a half-chewed looking mess. A crewcut was the easiest way to fix it. He is a bit abashed by it and I doubt he will try doing his own haircut again. I bought some wine which was also delivered today by a very rude Aust. Post courier. Am hoping the next delivery will be more pleasant. At least he did deliver it. My last delivery by one of those couriers did not even rate a ring at the security door downstairs. Even though it was a small package, it was taken straight to PO and I had to collect it. I was not very happy, he didn't even say which PO and there are three all much the same distance from here. He also carefully did not put his name or truck number on the card left. I think my poor toe is making a bit of progress. I've had shoes on most of the day and it feels reasonable. I'll lose the nail and am not sure whether there will ever be another nail grown with the damage to the toe, but the I believe the toe was itself also broken. That bit seems to be recovering and about time too. I do hope our toe gets better soon. I remember cutting my hair when I was little, I think I just ended up with a fringe though!! You are very adept with your new Kindle and your shawl sounds lovely too. Our post and parcel deliverers are lovely. They even pat The Girls through the front window!! Our TV is a 32 as well. Just big enough, but not dominating the room. Yours sounds a bargain too. Ouch on the toe. I hope it heals soon. We bought an excellent sofabed at this place on Victoria Rd at Drummoyne: http://www.cp.onlinefurniture.com.au/shop.php Not cheap, but excellent quality and, we are assured by various vistors, very comfortable. And it's easy to pull in and out too - like a big drawer. They had 3-4 different styles and a lot of different fabrics to choose from. Ooo! I hope your toe gets better soon. Let's hope that Master 5 has indeed learnt his lesson. AusPost - hmm! I am home most days and have received parcels most days in the last week for the Charity of the Month: most days he doesn't knock or ring the doorbell, just leaves the parcel on the porch and puts the card to tell me he's done so in the letterbox! Humph!